Pizza is arguably one of my favorite foods. 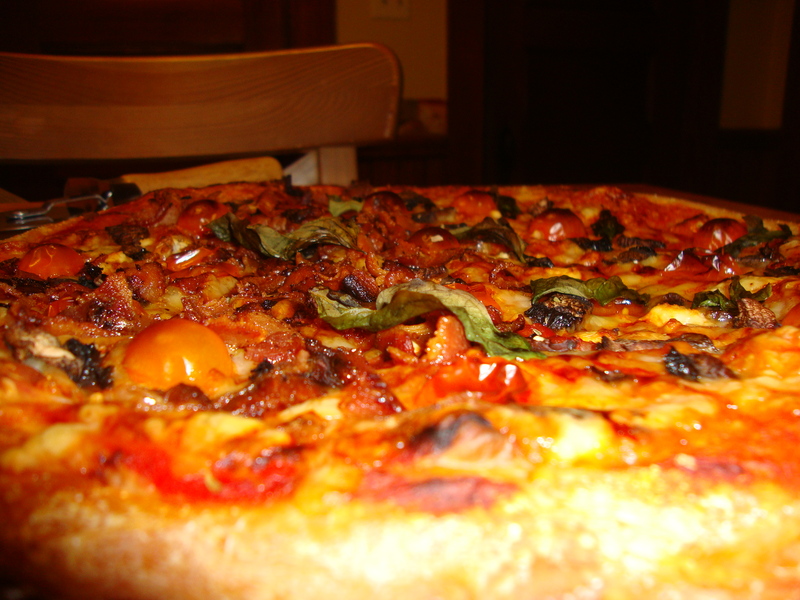 Just ask my girlfriends from study abroad… I was housing a full pizza about twice a week. I would love to make my own dough regularly and have it frozen and waiting, but I’m a busy woman with lessons to plan and people to care for. 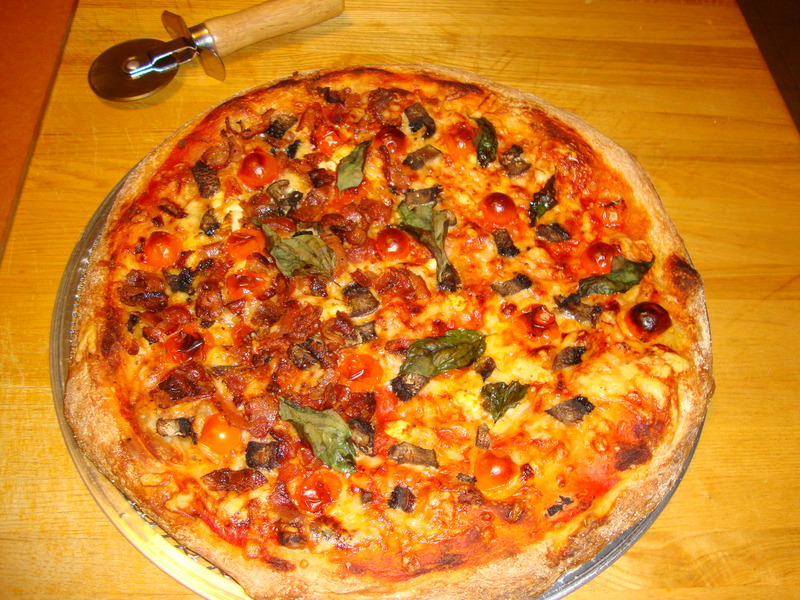 I was inspired to make this pizza because my friend Roseann up the road gave me some beautiful little orange cherry tomatoes from her garden that were more like a dessert than a tomato – they were that good. I bought my pizza dough frozen from the bakery at Stop & Shop and dethawed it in the fridge for a full day. Then another hour or so on the counter. Plan ahead! It’s no fun working with very cold dough. If you are a big pizza fan like me you should consider investing in a pizza stone and peel. It’s just so much more fun. Lots of yelling and hand gestures are also recommended. 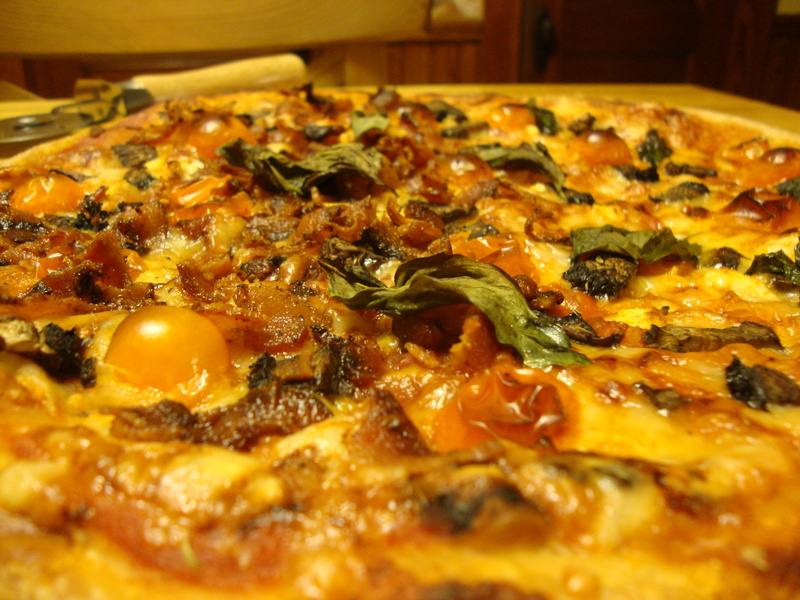 I always use corn meal underneath my dough because pizza just isn’t the same without it. I sprinkle some on the stone and rub it around. Or you can sprinkle it directly on the dough. I stretch my dough using this hand technique at about 2:00 minutes. 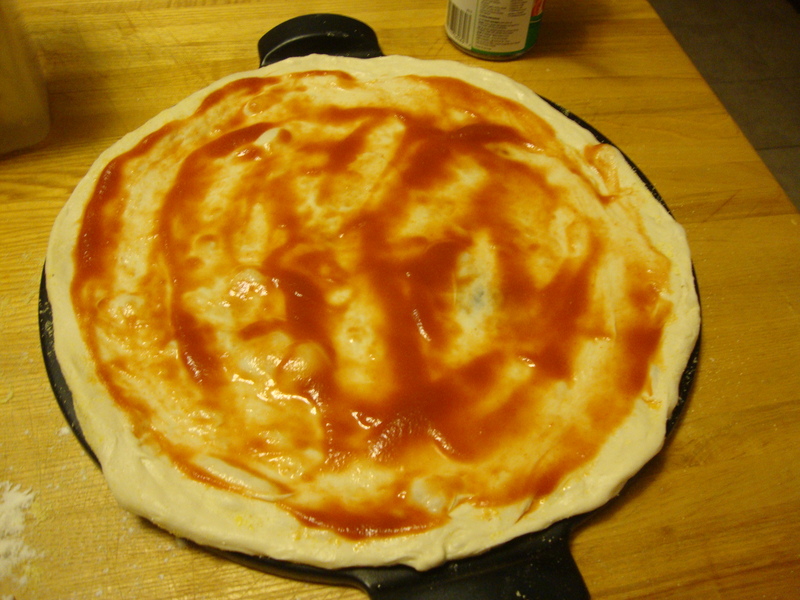 I learned how to do it at a pizza class I took at the Institute of Culinary Education (ICE) in Manhattan. It’s very easy and fun. Watch your rings. I only use a tiny bit of flour before doing this. I use my fingers to shape the crust. Ideally your pizza stone will be heating up in your oven but I actually forgot to do that and just prepared my pizza directly on my stone. Whoops. It still came out well. Preheat your oven to at least 450 degrees. Depending on how dark you like it you might want to go up to 500 (I would). At 550 the toppings might start to burn a little but will probably be fine. Pizza likes heat. I always spread my sauce (canned) first. Followed by shredded cheese (combination of swiss leftover from the French Onion Soup and Parmesan). I need to be a stickler here and say that freshly grated cheese is far superior to pre-shedded cheese. I have never looked back. Then I cut my cherry tomatoes in half and placed them on top. Some leftover bacon was chopped up and added to half the pizza. Also chopped up a portobello mushroom (Steph C. you got me addicted from all your funghi pizzas). 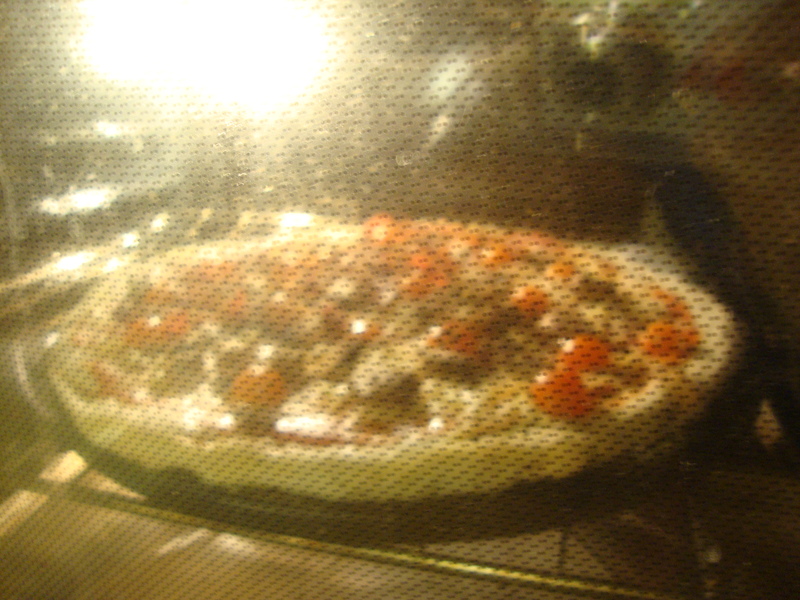 A shake of oregano on top and into the oven. You can consider a drizzle of EVOO depending on your toppings but a lot of cheese and some meat will have plenty of oils. Keep an eye on the pizza – roughly 15 minutes should do it. If your oven isn’t hot enough or the bottom doesn’t look brown keep it in longer and try turning up the heat. Nothing to be afraid of. Add basil on about 1 minute before you remove it (Basil was from MIL Nancy’s garden – how lucky am I?). You could do the same with arugula. You don’t want to torch it.